We offer cost efficient calibration services for your precision test equipment and standards. Our laboratory standards and metrology equipment is traceable to national standards (PTB). 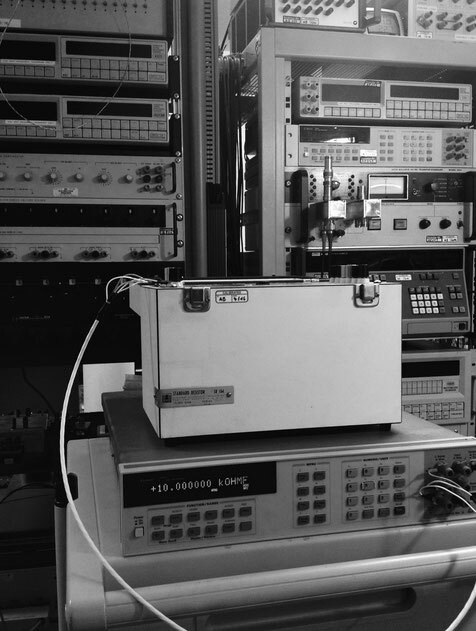 Our focus is on the calibration of highly precise test gear and low measurement uncertainties. We achieve this by having our test equipment and standards calibrated with very tight calibration tolerances. Our standards for 10V, 1Ohm and 10kOhm e.g. are calibrated with an uncertainty below 0.5 ppm allowing us to keep the annual uncertainties below 1 ppm. While sometimes the common understanding is that calibration includes the adjustment of the item under test, calibration really only means the verification of the equipment's deviation against a standard with known uncertainty. Sometimes it is actually even desirable to not adjust certain equipment, e.g. to determine its drift rate between calibrations. Other items, such as e.g. resistance standards can often not even be adjusted. Therfore depending on the item, the customer may first have to decide what action to be taken. We offer both options, only verification (calibration) or adjustment (prior verification on special request) with subsequent verification (calibration). Each calibration is accompanied by a report also identifying the measurement uncertainties. The list below is an excerpt of the most popular precision test gear only which we support. Special care is taken to keep measurement uncertainties low. E.g. our 10V and 10kΩ standards are kept at uncertainties below 1ppm. For actual uncertainties for your specific meter please contact us. For other equipment not listed here, please contact us. calibrations we perform. Do not use our calibration services if your application requires such compliance.